The Mystery 35 from UK-based Cornish Crabber Boats is a traditional, hand-built fast cruiser that hails from an era when seaworthiness, handling and ride comfort were more important than interior volume and cockpit space. The design brief given to renowned designer Stephen Jones was to create a boat that had the looks of a classic, the performance of a racer and adequate accommodations to enable her to be cruised extensively. The Mystery 35 from UK-based Cornish Crabber Boats is a traditional, hand-built fast cruiser that hails from an era when seaworthiness, handling and ride comfort were more important than interior volume and cockpit space. The design brief given to renowned designer Stephen Jones was to create a boat that had the looks of a classic, the performance of a racer and adequate accommodations to enable her to be cruised extensively. Jones has succeeded admirably in all three areas. The Mystery’s spoon bow, counter stern and gentle sheer fulfills the first criterion, giving her a classically elegant look. As to requirement number two, you&apos;ll find a typical Jones profile underwater: sleek lines, fine bows, wide but shallow after sections, and a profiled keel with a trailing lead bulb that gives the boat an impressive 48 percent ballast ratio. A low center of gravity is essential, as the boat&apos;s narrow beam means she has less form stability than her contemporaries. The Mystery&apos;s hull has solid hand-laid fiberglass below the waterline and foam-cored topsides. The deck is balsa-cored. Chopped strand mat and woven rovings are used throughout, with solid plywood backing pads beneath deck fittings. The hull/deck joint is both through-bolted and glassed over to keep it watertight. 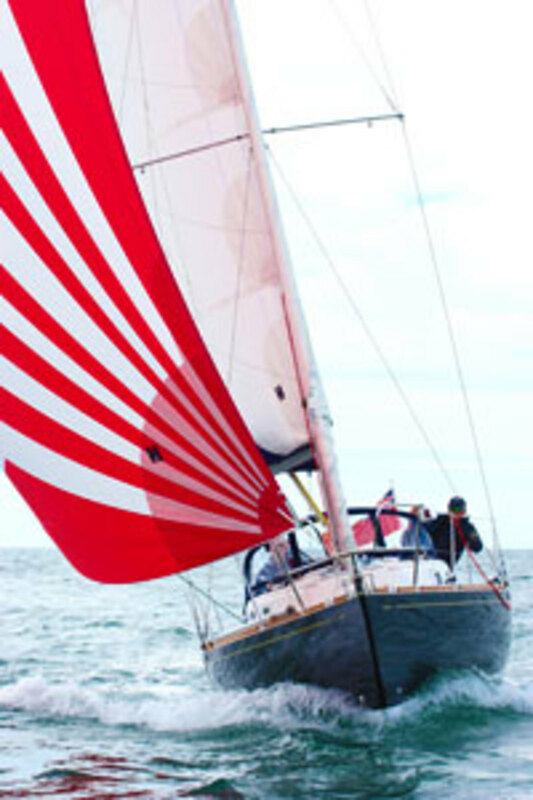 The boat’s rig is 7/8 fractional, and the Seldén mast, with twin swept-back spreaders, can be keel- or deck-stepped. An adjustable backstay and rigid vang are standard. The 110 percent jib is on a below-deck furler. The Mystery has a simple layout with a generous afterdeck and a narrow cockpit that make it easy to walk completely around her superstructure—a rare feature these days. Her antiskid deck is very grippy, and it’s only a low step up onto the cabintop, where the jibsheet tracks are mounted for a tight sheeting angle. The long, narrow cockpit is also very secure, set within deep coamings, while a long, hinged tiller enables the helmsman to operate the winches beside the companionway. Wheel steering can be fitted, but this takes up more of the narrow cockpit and entails moving the mainsheet from a traveler behind the rudder to a single deck eye just forward of the steering pedestal. Under the lazarette deck there is a large locker, ostensibly for the liferaft, although it&apos;s capable of holding much more. There is another deep locker under the port seat. The deck gear is well sized, with Barton tracks and blocks, and substantial mooring cleats. A steep companionway ladder lands you between the galley and nav station. The galley to port has ample counter space, a deep sink, plentiful stowage and a fully gimbaled stove. The nav station has a full-size chart table and dedicated seat, but without back support. Instead of the spacious quarterberth, you could specify a second cockpit locker and get a back for the nav seat. Owing to the Mystery 35’s narrow beam, the saloon is not vast, but the settees will make excellent sea berths. There’s plenty of stowage under each settee, as the water tank is under the forward bunk, and the diesel under the cockpit. The two batteries and the water heater are under the quarterberth. 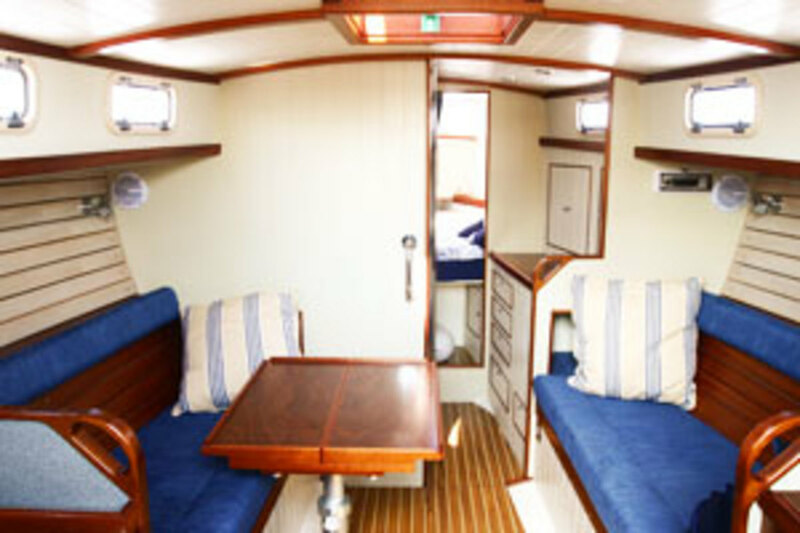 Forward of the saloon is the head/shower area, with a toilet to starboard and a sink to port. Closing off the forecabin and saloon doors makes this a decent size compartment with over 6ft of headroom. But this blocks access to the forecabin, so some have chosen to omit the shower, put a fold-down sink over the toilet, and turn the area to port into extra wardrobe space. The forecabin is narrow, and the foot of the V-berth may seem tight for two tall people. To gain extra legroom, you could do away with the two narrow hanging lockers. Ventilation is reasonable throughout, with four opening portlights in the main cabin, two in the head, plus a vent and a hatch over the table and in the forecabin. We set sail in 12 knots of wind and fairly calm seas and were soon tramping along at 6.2 knots under full sail. 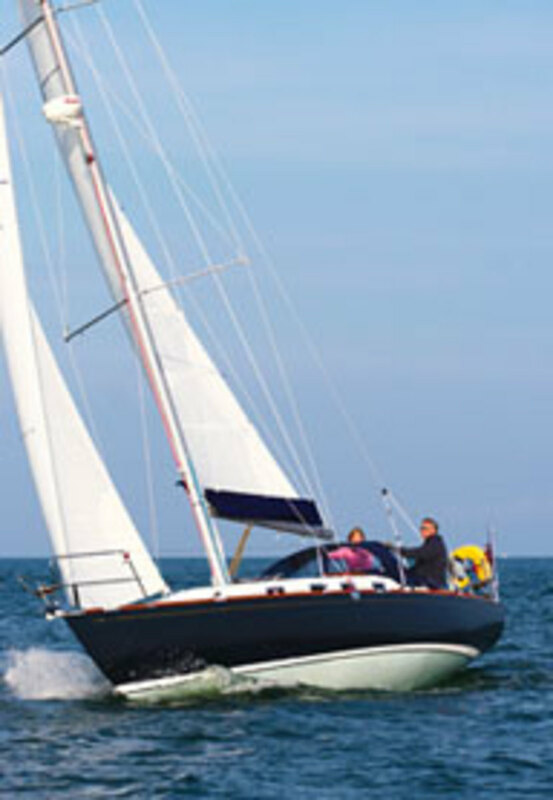 In short, the Mystery 35 is a delight to sail, with a light, but very positive helm. She can sail herself to windward with a light line securing the tiller. She also has a wonderful, seakindly motion, thanks to her overhangs and narrow forward sections, which part the waves while creating minimal bow wave and wake. Although initially tender, the boat&apos;s hefty ballast soon kicks in, and she stiffens up admirably. She tacks through about 80 degrees and comes through the wind quite rapidly, accelerating quickly back up to speed. We were able to heave-to easily, lingering comfortably at 45-50 degrees off the wind with a gentle rocking motion. In 16 knots true wind, we made an impressive 7.4 knots boat speed under the A-sail. Although it is possible for a six-footer to see over the coachroof from the seated position, most will want to sit out with a tiller extension, which is not overly comfortable due to the narrow coaming tops. The standard engine is an 18hp Yanmar with a saildrive and folding two-blade prop. This generates plenty of power and can drive the boat through the sea at around 5.5 knots at 2,500 rpm. Flat out on calm water she can achieve 6.8 knots, but at the expense of extra noise and increased fuel consumption. A bigger engine is optional, but not really necessary. Under power she is almost as easy to spin around on her keel as any modern hull and goes astern with little fuss or drama, picking up steerage at speed. The Mystery 35 is a pleasure to look at and even more of a pleasure to sail. She is good for racing or cruising alike, but with her narrow body and considerable overhangs, she doesn’t have as much interior space as most modern boats. 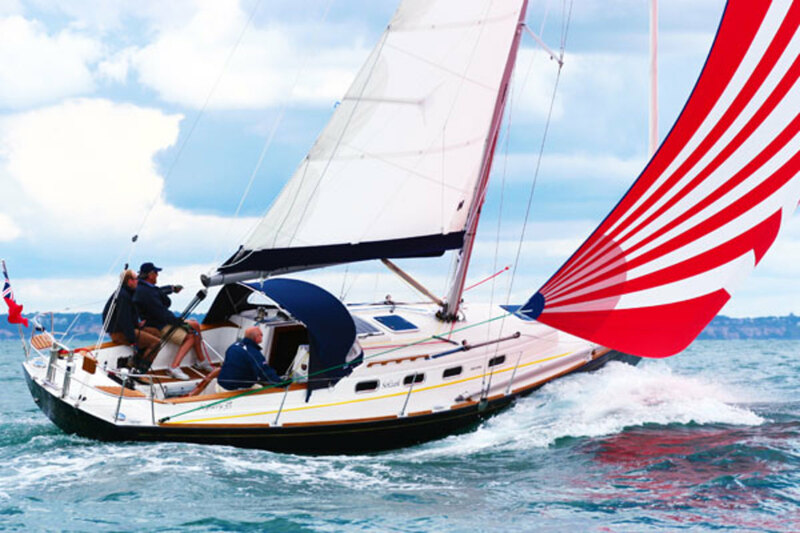 If you’re looking for a new boat that’s a little bit different, and looks, performance and seaworthiness are all important to you, then you really should take the Mystery out for a trial sail.